And greetings from Quezon City! During these earliest weeks since we arrived in the Philippines, there has been much to do and to share with all of you. Exciting as it is to start this new chapter, this move has also been physically and emotionally exhausting: from the many things to do before leaving and saying goodbye to Michigan, to the many things to do here and now in our new home. 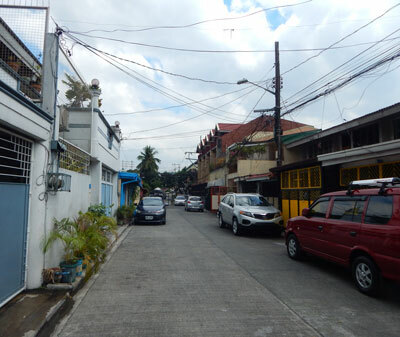 As if the time difference of 13 hours was not enough, the initiation into our new Philippine life has included our adjustments to the heat and humidity, noise, and dirt. For the first few days we stayed in an apartment/hotel known as an “apartelle.” With the help of different staff members from the national offices of United Church of Christ in the Philippines (UCCP), which is our main church partner, we shopped for major appliances and furniture, and thankfully A/C units. To help us make the apartment more livable, several colleagues from the national offices gave their extra time and energy to set up additional electrical wiring for a new A/C unit and washing machine. We’re grateful for the ways in which these two went out of their way to help us! Our new apartment is within walking distance of a golf course and two mega-malls equipped with Starbucks, Mister Donuts, and other familiar fast-food chains. The apartment already serves as a refuge, helping us to turn on the mute button from traffic and other noise of life. The rumbling and grinding traffic is slowly becoming more background noise to us, although it’s not always easy to settle back into sleep during the wee hours of the morning, followed by the cockadoodling roosters. Watching golfers at the club and joining throngs of mall-goers, we wonder about the lives of most Philippine people. While it seems that we and our neighbors live with many comforts and amenities, poverty is not too far from us. We observe how young children on the sidewalk play barefoot and naked near construction sites. Young boys beg from/hustle passersby for loose change on the pedestrian bridge that connects two mega-malls. From the customer associates in mall stores, to the jeepney drivers, to the vendors selling dusters and fresh fruit, we wonder about the lives of everyday people. When not fixing up, cleaning up, and shopping for the apartment, we also visit with our landlord “Tita Nina,” who lives two doors down from us. For Aurélie, our 4-year-old daughter, who lives far away from both sets of grandparents, and for “Lola Nina,” who lives far away from her grandchildren, this new relationship between adoptive granddaughter and grandmother is a surprise blessing from God! On March 13 we worshipped at Cosmopolitan Church, which was celebrating its 83rd anniversary and Palm Sunday with a unified worship service in English. This congregation is probably among the largest UCCP congregations. The church newsletter handed out that day, along with the church celebration, gave us insight into that congregation as well as Philippine history. With the recent passing of Senator Jovito Salonga, there was an article written by the UCCP General Secretary that outlined his many achievements and enduring legacy of speaking truth to power. Surprisingly there’s a lot that we can learn about a church from these pieces of paper! During Holy Week we began worshipping at our new home church called the National City United Church (NCUC). Located right by the UCCP offices, this church is the closest congregation to us with English-language worship services. Our first worship service was Good Friday, with a brief meditation on the last seven words of Jesus. Powerful preaching and praise from the Chancel Choir, with two powerful soloists, helped us to enter into the last days and moments of Jesus’ earthly ministry. 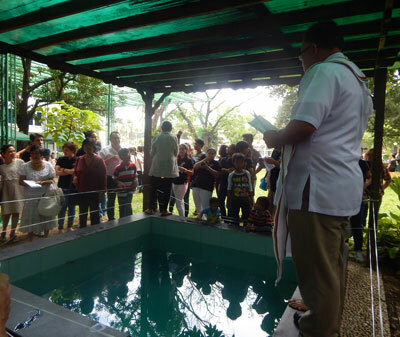 On Easter Sunday our family woke up early for our first-ever sunrise worship service at 5:30 a.m., which was combined with the church’s 54th founding anniversary celebration. An early morning mist and cool breezes awakened us, although it was initially difficult to rouse from bed. Once in the sanctuary the vibrancy and joy of worship overcame us with songs from a praise band led by young adults, mostly familiar Montreat favorites, according to Juan. As with Good Friday, the choir wowed us again with their heavenly voices singing their anthem and the Hallelujah Chorus. Most memorable and meaningful on this day was what happened when festivities spilled over into the garden with breakfast and the baptisms of four adult members in an outdoor baptism pool. Among those baptized that day was the choir director, who had been leading the Chancel Choir just moments earlier. How wonderful it was for us to witness these baptisms and to join in the celebration with singing and cheering after each young man emerged from the baptism pool. Looking forward to the upcoming months, our goals are finding a preschool for our daughter and preparing for Tagalog language study. June is the start of the new school year, so we will need to make some decisions about Aurélie’s education. In late April Cathy will be traveling to Louisville, Kentucky, in order to attend training for all regionally based mission personnel. Before and after that week Cathy alone will be itinerating throughout Indiana, Maryland and Virginia, Minnesota and Iowa. Aurélie will be turning 4 on May 1—something Cathy is sad to miss, but we’ll have a belated birthday celebration when she returns to the Philippines. Our home church will host “Vacation Church School,” in which we hope Aurélie will enjoy the activities and maybe even make some new friends. Please continue to pray for all of us and these different events and decisions associated with these transitions. Thank you for your prayers, which connect us with one another and with our church partners, as well as your financial support of God’s mission in the Philippines and Southeast Asia. If you are not already supporting Presbyterian mission workers, please prayerfully consider becoming part of our family of supporters. PLEASE NOTE: Human trafficking is an organized criminal activity in the Philippines and throughout Southeast Asia. We are still learning about what it looks like and the scope of our ministry. Until we have a better sense of safety and security in our new home environment, thank you for respecting our privacy needs. We will not post too many pictures of our family or publicize our new home address. Please contact us directly if you have any specific questions or concerns.